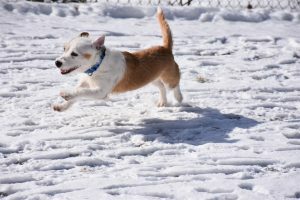 Sugar is an 18-month-old tan and white rough coat female Jack Russell/cattle dog cross. Sugar weighs about 15 pounds. Sugar was a Louisiana save; one of our rescue partners pulled her from a shelter before she was placed on the list. We could not say no to this adorable and very loving little mix. A terrier with an attitude, extremely young, tons of energy and loves doling out kisses without your asking. 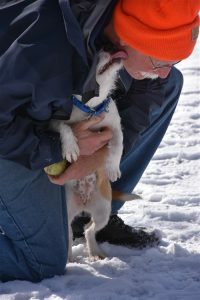 She has the ball-chasing attitude of the jack, with the herding instinct of the cattle dog. She is enthusiastic, vibrant, extremely smart, and very very much wanting to learn; she NEEDS to be active and busy. Sugar is not for the faint of heart!!! She would make a great sporting dog, or even a running or hiking partner, with the stamina of a very young and athletic critter. Sugar would benefit from a very secure fenced in yard. She is almost 100% housetrained, she just needs to learn your schedule and get into a new routine. This girl absolutely adores people and loves giving hugs to anyone willing to accept them. She does get overstimulated when she plays and must ratchet it down and must adhere to some basic manners when it comes to rest time. Sugar is a very wonderful snuggler. She is crate trained; she rides beautifully in the car, and is willing to learn anything you want to teach her. Sugar does fine with dogs her size or smaller but does NOT get along with larger dogs. She does have a strong streak of feistiness in her and will not put up with a dog she deems too large. 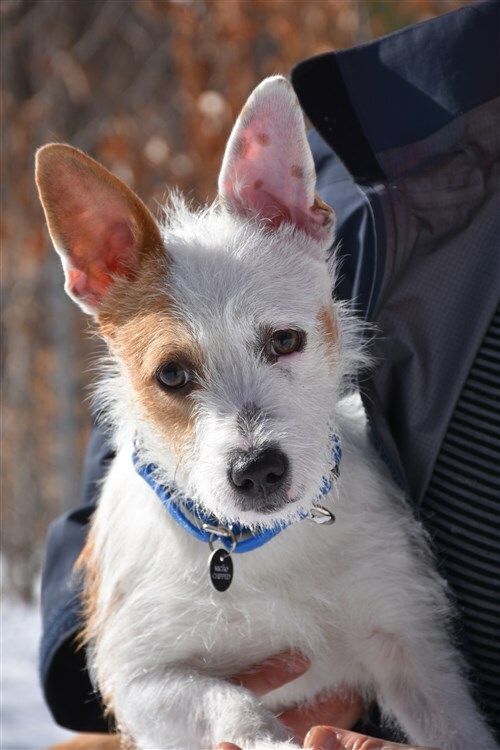 She does play rough with her dog pals and is definitely an alpha, so a like-minded playmate would be perfect for this very young and delightful JRT mix.